Posted May 19, 2015 by finnfemme & filed under Beauty, Daily Life, Fashion, Vintage. With a back-to-nature flair, Yardley of London introduced their Oatmeal Beauty Soap in 1974. At this point Yardley was phasing out their much-celebrated cosmetics line and going back to their origins of selling soap (English Lavender, anyone?). You can’t get any more crunchy hippie than this ad, at least by Yardley of London standards. Just the bar of soap being scooped out with a handful of oats from a jute bag. Along with a 10 cent store coupon. I don’t recall seeing coupons in any of their previous advertising, so I think that was a first as well. 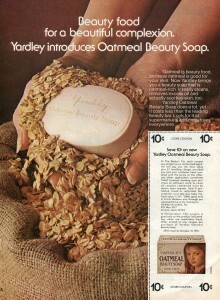 No doubt that this was a good soap – “Now Yardley brings you a beauty soap that oatmeal-rich. It really cleans, removes excess oil and actually soothes skin, too.” – but, alas, it was wistful for those of us who rued the loss of the Yardley makeup line. Marilyn, I hear you! I was 12 when Yardley make-up entered my life. Mom thought the colors were light and pretty. She also approved of the pretty packaging. So I started with the Slicker lipsticks. I miss this make-up even today. They also made darker colored lipsticks. At the time my favorites were a kind of mauve-pink and another pinkish color. They were called “Good Morning” and “Good Night”. 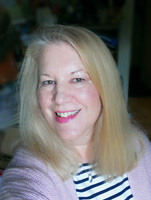 My first dark slicker lipstick was “Romeo Red” which came out about the time the Zefferelli’s “Romeo and Juliet” was released. If you search my site, you’ll see that I have many posts on Yardley of London ads of the late 60s/early 70s. It was such a wonderful cosmetics company at that time, and we were lucky to be part of that era! I was more of a Pot o’ Gloss girl myself. I can still smell its intoxicating aroma, and loved the glossy, sticky texture.